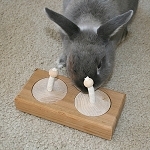 Since one of our elder buns just couldn't figure out how Linnea works, we had to come up with a less challenging toy. 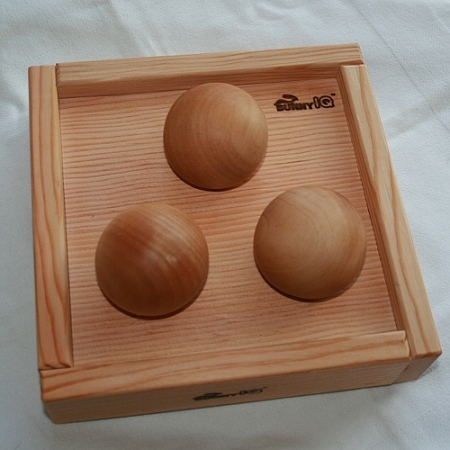 Blenda has 3 treat recesses covered by 2 1/2 inch wooden balls. 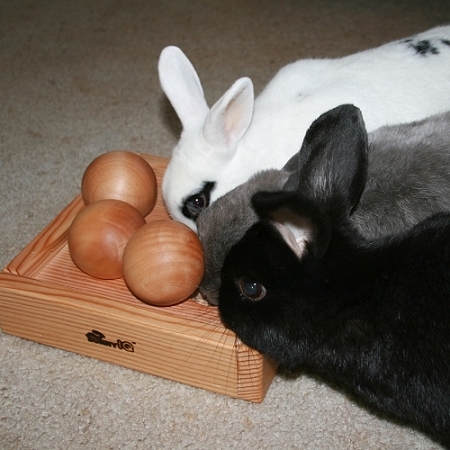 Your rabbit will have fun nose-bonking the balls away and figuring out where the treats are hidden. Blenda comes with a small bag of Bunny Bites, which fit neatly into the recesses. One of my bunnies had a bit of difficulty figuring out Linnea, so I bought Blenda. Now, she has mastered both. I think we enjoy watching the bunnies just as much as they enjoy playing! What wonderful toys! *the Bunny Bites are a hit too! 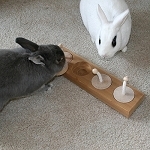 My two rabbits love this game! They hear me taking it out and right away they know that they are going to get treats. 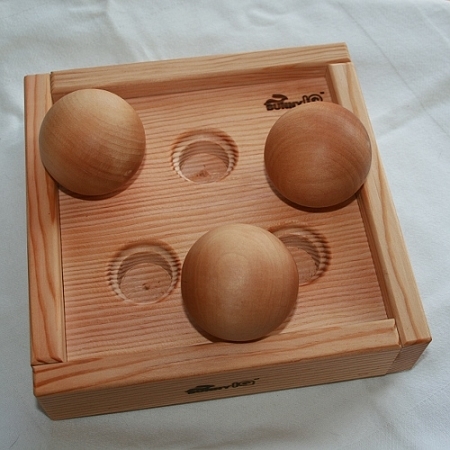 They love to push the balls right out of the box. Every time I put them back, they push them off. Lots of fun! My Flemish Giant took his big head and knocked the balls away like bowling pins. He got to the treats in 2 seconds flat. Our mini rex likes to push the balls around the room. So Cute! Blenda is VERY easy to figure out....well, for me anyway. I am very good at the Bunny IQ toys. The rest of my family finds them challenging, though. Jack figured out Blenda pretty quickly, but everyone else is still stumped. Or maybe they just figured out the game and are too stubborn to play. I, on the other hand, LOVE to work for treats. 2 paws up and 5 stars on this from me! I already own the other toy with the lids on ropes, and my male bunny has figured that one out. However my little female mini-rex never got the hang of it, so instead waits for the male the lift the lid and swoops in for the kill. Now I own the one with the balls, and my female took to this one right away. She likes to push things out of her way, so this one was much easier for her to figure out. I REALLY love my new toy!! I figured it out on the first try! Mom is very proud of me. My bunny boys, Bender and Scooby just don't quite get it yet, but it shouldn't be too long before they go. The Linnea frustrated me. I just didn't know what to do with it and ended up flipping it over several times. The Blenda is perfect for me. I am good at shoving things around!